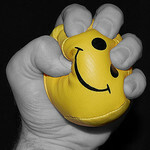 Stress is the difference between the way things are and the way we think they should be. This means that we can reduce stress by either changing the outside world or changing our perceptions. Both are valid approaches. We may think that changing our perceptions is hard to do. But it is waaaaaaaay easier to flip our perceptions than to change the outside world or the people in it. PS: Sometimes we think that changing our perceptions is an admission of error or defeat. Nope. It’s simply raising our buzz. It’s the fastest path out of stress and into joy.